We will commit to service excellence, creativity & innovation. Customer satisfaction will be our key pillar and we take pride in our contribution to enterprise growth. In our mission, we will build a culture around our corporate core values, Passion, Focus & Responsibility. We are deeply enthusiastic in pursuing our dreams to better the lives of our co-workers and the community we live in. We will focus on pursuit of service innovation and excellence and create opportunities for enterprise growth and personal advancement..
We will support initiatives to care for the needy community and work closely with society for the greater good of our nation. ENOVAX Pte Ltd commenced operations in February 2010 and grew from a modest I.T. business solution provider into a full-fledged and integrated company offering a full suite of "one-stop" customised IT solutions and internet-driven services via seamless web, mobile and kiosk/gantry applications/platforms. Since our inception, we have steadily beefed up our operations, and from a humble beginning with only a lean team of 5 staff, ENOVAX today employ some 30 people with different industry skills set to meet the exacting demands of the rapidly growing sophistication of customers’ needs. Today, our scope of services has expanded to include intricate turnkey projects involving complete software system design and architecture, optimised IT business solutions and integration of external parties' hardware and state-of-the-art technology. Our company’s mission is to be a leading professionally managed I.T. business solutions player in the market, by continually making technological break-through, posting key milestones and satisfying clients’ expectations, coupled with continuous management & staff upgrading. Our aim is to be able to expand and grow, both in size and market depth, with our clients’ success in mind as a key business driver. ENOVAX PTE LTD was incorporated on 17 February 2010 by IT Entrepreneur Mr. Erwin Foo, with a strong positioning from the onset to be a market leader providing a full suite of optimized IT business solutions and internet related services via seamless web, mobile and kiosks/gantry applications/platforms. Serving the needs of the local and international business communities, ENOVAX has accumulated a wealth of experience and know-how on the dynamics of integrated business solutions to accelerate enterprise growth. Worthy of mention is our pride in having our own team of in-house I.T. professionals (software architects, engineers, consultants, programmers and designers) who are about to handle and support all clients’ extensive enterprise solutions without outsourcing any work to third party vendors. This strength is much appreciated by our customers. As ENOVAX Group embarks on its branding and market positioning journey, it is necessary to improve the communication channels with both employees and clients alike. As the company grows, we will continue to highlight through our various media and publicity platforms of the latest developments in ENOVAX so that both employees and clients can be timely informed of news that may impact or benefit them. 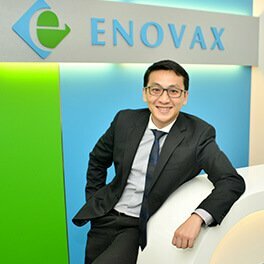 ENOVAX PTE LTD scores another remarkable mile-stone at the start of 2019. 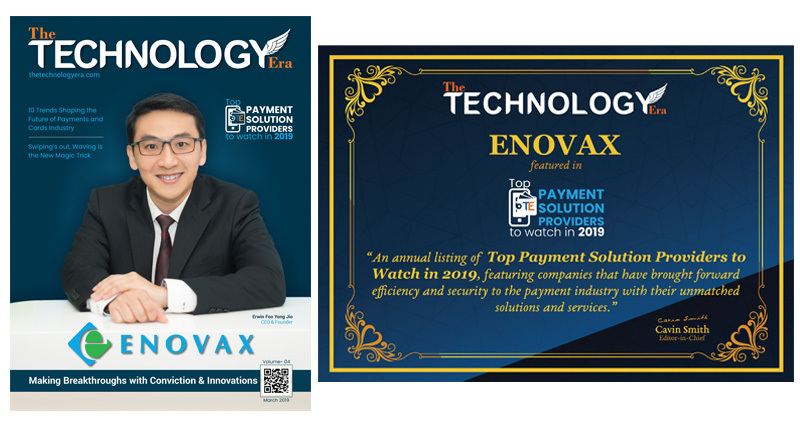 Our company ENOVAX has been listed as one of the "TOP PAYMENT SERVICE PROVIDERS TO WATCH IN 2019" in the American IT Magazine "THE TECHNOLOGY ERA". Published in the March issue, our CEO Mr. Erwin Foo is being featured on the FRONT COVER of the magazine and there is a 5-Page editorial on ENOVA/PUC Berhad. 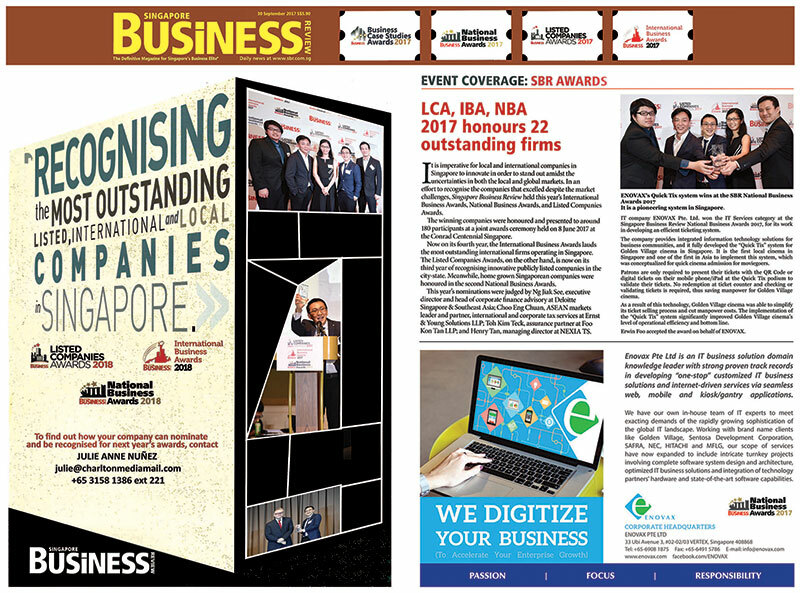 On 8th June 2017, our CEO Mr. Erwin Foo accepted the Singapore Business Review (SBR) National Business "IT Services" Award. Some 180 industry captains and key business representatives attended the glitzy event presented by Singapore Business Review. This Award, together with other Categories of awards, seek to recognize and acknowledge local and international companies who strive to innovate amidst the uncertainties on both the local and global markets and excelled despite market challenges and rising competition. Going forward, we hope this accolade will inspire ENOVAX's future growth pillars and accelerate the company's aspiration to be the best in the industry. As ENOVAX moves forward with its publicity activities to raise the visibility of the company, we have progressively rolled out various marketing and promotional programs. In this connection, a short corporate video was produced which was screened at the Grand Gala Dinner at Ritz Carlton Hotel as part of the Singapore Prestige Brand Awards 2016 Ceremony. ENOVAX was a Winner of the SPBA 2016 Promising Brand Award. 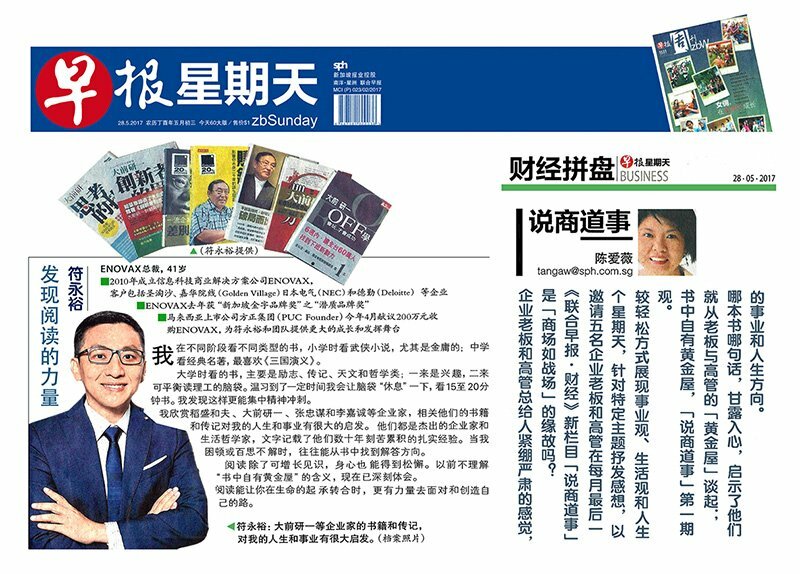 Following the acquisition of ENOVAX by PUC Founder (MSC) Berhad, Lianhe Zaobao (local Chinese daily) featured an article on Mr. Erwin Foo, CEO of EOVAX on his life philosophy and the types of books that he reads for inspiration, pleasure and business directions. Mr. Foo shared that growing up, he read different types of books - from primary school to secondary schools and university. These days he prefers reading books by successful educationalists, industrialists and businessmen on their life journeys, business decisions and life experiences which he felt helped him draw inspirational energies and balance in life pursuits. Copyright © 2010 - ENOVAX Pte. Ltd. All rights reserved.